and it was quite the adventure for Mommy and Daddy! Around 1:30 am I was woken up with my first contraction after only an hour and a half of sleep. Jon and I had foolishly stayed up talking. I wasn’t completely sure it was real right away. Ten minutes later I had to moan through my second contraction and ended up waking Jon. I was pretty sure this was it with the second one. Of course I couldn’t sleep knowing my baby was coming so I got up to get a snack and watch the season finale of Downton Abby season 1. Around 3am I was sitting on my big exercise ball at the table watching the episode when I coughed, I still had a bad cold, and thought I had peed myself. Hindsight, that is probably when my water broke. Contractions were about 60-90 seconds each and about 5 minutes apart although that fluctuated a bit. I couldn’t sit through the contractions so I got in the tub for pain management. It helped a lot, I just wished it was a little bigger to rock and move around a bit more during a contraction. We texted our doula and started alerting people between 4 and 4:30am telling people there was no rush. We needed my sister to come from Abbotsford to take care of Sofie for us and have my mom make arrangements for the ladies she takes care of. Liz got here around 5am and Kristi, our doula, arrived around 5:30. At this point my contractions were still over a minute long and 3 minutes apart but they ended up slowing down to 5 minutes apart again. They were definitely more intense though. Having Kristi there was so helpful. She reminded me of different breathing techniques that really helped that I of course forget in the moment and Jon doesn’t remember either. I was handling labor just fine. Compared to the back labor that Livi gave me, this was a breeze! It still hurt, but it wasn’t ripping me in half. We decided to try the tub again since the contractions had slowed to 5 minutes apart… Three contractions in the water and I was done. They shot up to about a minute apart and Kristi thought she heard me sounding “pushy”. I was still handling everything quite well though so I wasn’t really that concerned. I just thought these were normal labor contractions. I wasn’t really pushing. Kristi was like “maybe we should go…” That was just before 7am. We still had a 30 minute drive to the hospital! I started realizing that I was further a long then I thought once I got in the car. 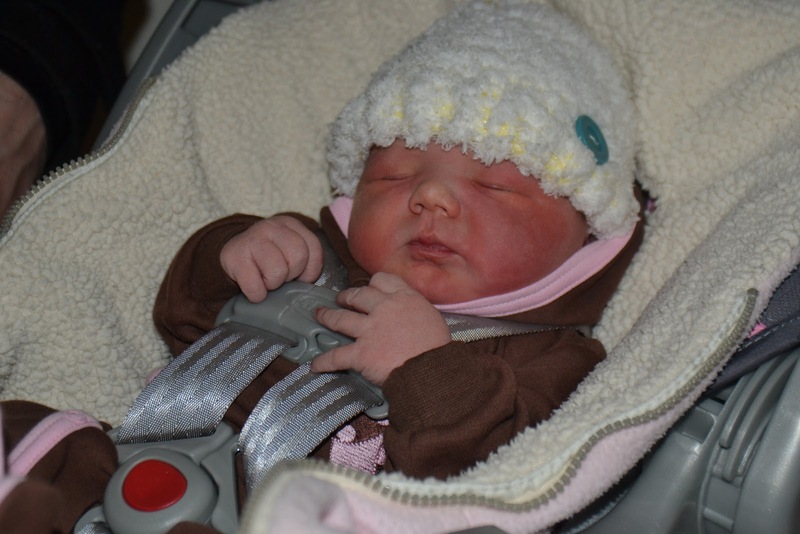 I couldn’t sit through a contraction, consequently having no hope for a seatbelt despite the icy roads. I knelt backwards in the back seat praying they would slow. I tried to focus on alerting everyone to meet us at the hospital. My friend who was going to photograph the birth texted back saying to let her know when I reached 6 cm because that’s when she would head over. I remember thinking I’m pretty sure I’m already 6cm but had no way of knowing. I still thought my water hadn’t broken yet. I also called the hospital to let them know we were on our way and told them that my doula thought I was a little “pushy”. The nurse said they don’t call the midwives until after they have checked me at triage. I remember being a little annoyed that she wouldn’t call and I didn’t have the midwives number to do it myself. Not the biggest deal because right around then my attention changed… my body was pushing. We still had about 15 minutes to drive! I kept denying what was happening in my head but Jon could hear it. He started speeding, more, and tried not to yell at me NOT to push. This stage was still easier than my previous back labor by the way, which is why I was still trying to deny it. I was puffing my way through the back to back contractions trying my damnedest not to let my body push. I even reached down at one point afraid I’d feel the baby’s head. Poor Jon. He was freaking out. He could hear me grunting and knew what was going on. Kristi was following us in her own car. We got to the hospital at about 7:15am and I had a long way to walk through the lobby… I got out and immediately had to bare down. Jon did yell this time “Don’t push!” I yelled back at him that I couldn’t help it. My body had taken over. Kristi was there and took my hand. I never would have made the walk through the lobby with out her. She was my rock that kept me from collapsing and giving birth right there. Jon had gone to park the car and I remember thinking that he was going to miss the birth of his child in the lobby! The nurses sprung in to action. Their faces were shocked. The admin told another nurse to get me a room and told Jon they’d take care of the paperwork later. She must have gotten my name from some one because I was entered in to the computer at 7:27am. Some one grabbed a wheelchair for me but there was no way that was going to work. I may have even laughed at their attempt. A nurse grabbed one hand and Jon took the other rushing me down the hall. People kept asking, “where are you taking her?” and she replied with “I don’t know!” Some one shouted to take me to room 18. I kept trying to reach the wall to bare down and remember thinking ‘what would happen if I gave birth to her with my pants and underwear still on?’ The nurse who’s hand I had sternly kept me away from the wall and told me that if I kept walking the baby wouldn’t be born. I wonder if that is true or if she was just trying to get me to a room. The second I saw the bed I whipped off my pants and shoes and knelt on the mattress. No one had told me if I was allowed to push yet. I remember asking some one to check me now! A doctor came in and concluded that I was +1 and to push! Thank the Lord! Apparently I was so excited to be able to relax I pooped all over the doctors hand the second I started pushing. Is that something you apologize for? The really awkward thing is that he was in Jon’s unit at Bible College 12 years ago! Jon later made a crack about me letting two guys at CBC get to third base with me. Nice hun. Anyways, we figure I only pushed a handful of times. I felt her crowning and yelled that I was going to tear when I felt the ‘ring of fire’. The doctor helped me stretch it out with little pushes. Her head came out and I had to hold back one more time because the cord was interfering somehow. I don’t know if it was around her neck or what, but he had to reach in to help pull some slack for it. One more push and she was out… at 7:30 am. We got to the maternity ward with three minutes to spare! They did pull her over to the check up table quickly just because it had been such a quick delivery. My placenta was still inside. I asked if I could turn around and Jon reminded them that I wanted to hold her right away. They brought her back to my chest and I was in heaven! Jon was crying and coming down from all his stress and excitement. 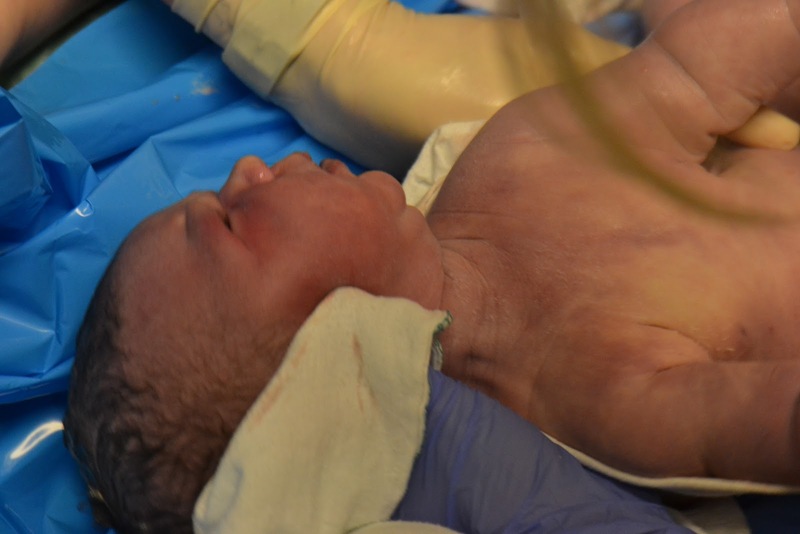 Evie’s birth was NOTHING like we expected. It was far less painful and much shorter than we thought. Everyone missed it! Our midwife showed up to deliver the placenta. My sister showed up about 5 minutes too late and my mom and Livi had missed it by only 10 minutes. Jon’s mom came a little later and we never did text my photographer about being 6 cm 🙂 I feel a little disappointed for everyone missing it but I think the story is epic enough that they’ll get over it. My sister texted my mom who was just in the elevator at the time that they had all missed it. Everyone was in a bit of shock. Mom tried to tell Livi that maybe the baby was already born but Livi’s answer was “Maybe not, and there is going to be blood!” Sorry Livi! Actually there was very minimal blood loss. The cleaning lady even asked if this was a C-section because the bed and bathroom were so clean, post birth and my rinse off. I had NO tearing. My midwife was amazed by this considering she came so quick in the end, was 10lbs 3oz, 22.5 cm long and had a head circumference of 27.5 cm! Jules, the midwife, said some would consider that sized head undeliverable. Not for these birthing hips! Too bad they won’t be delivering any more! Evie (pronounce EH-vee) did have some pretty good swelling on her face and bruising on her head, face and shoulder but it went down pretty quickly. She looks a lot like Livi did… but still different and fatter 🙂 She came on her ultrasound due date and actually doesn’t look over done at all. That confuses me because I thought she was at least a week overdue! Since everyone was on their way anyway, they all showed up right away to meet Evie. It was a busy maternity room with family and nurses trying to catch up on the paperwork. Evie went right to my breast and stayed there for nearly 3 hours! Awesome! This is a great sign for the breast feeding to come. She has slowed down a bit now and we are having to supplement with a bit of spoon fed formula because the bruising has turned in to biliruben and caused a little jaundice. Plus, my milk hasn’t come in yet and she needs more liquids in order to pee enough. She is rather large after all! I’m taking herbs to help with my milk supply already and since she is going to the breast so frequently we are expecting this to all rectify quickly. I am ravenously hungry too, to a higher degree than I was with Livi, so I know she is depleting me dry! With her attached to my breast everyone had to wait their turn to hold her! Vanessa took pictures for us when she showed up so once I get those I’ll do a picture post 🙂 We did get about 6 pictures on our camera because Jon had the frame of mind to shoot a few just after Evie came out. All our expected visitors had come and gone by noon so Jon and I decided to head for home after a short nap! I birthed her quick and was back in time for dinner! A bunch of people thought I should stay a night in the hospital but I figured I would sleep better in my own bed. I am a very quick recoverer post surgeries and births so I wasn’t worried. We had child care for the older girls. This was a great decision. I feel much more rested and comfortable than I would have been in the hospital. A midwife came to our house the next day and checked up on all of us and she is due again tomorrow, unless she is concerned about the jaundice and milk supply. We are all doing really well, despite me still having a horrid cough. Thankfully it is just a cough though. My sinuses are clear and energy level is up a bit. I’m back down to my pre-pregnancy weight! I only gained 13lbs and Evie was 10 of those pounds! My uterus went back down really quickly too. I’m surprised how contracted my stomach is already! 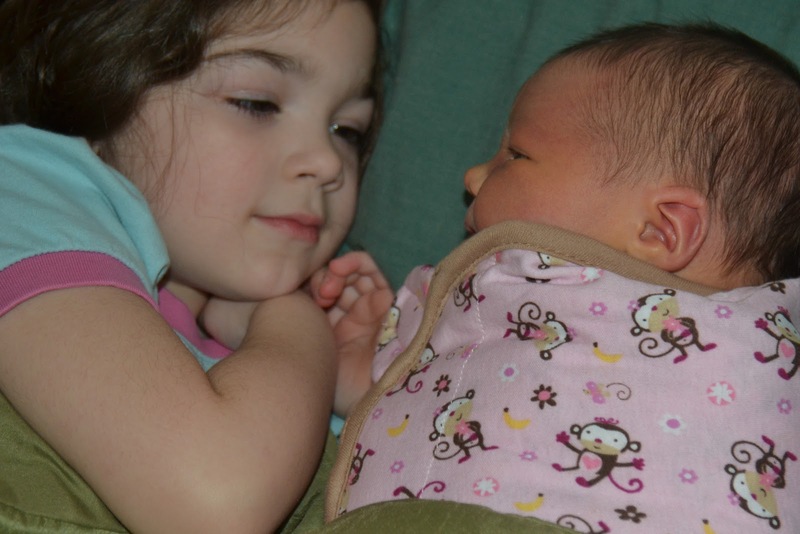 Livi is absolutely enthralled by her new baby sister. She dotes on her and narrates every little thing Evie does with a huge smile. It is pretty adorable. Sofie is… learning. She doesn’t care much for her sister yet but is trying to be gentle. She wants more attention from me, which was expected. I am trying to include her in cuddle time and give her lots of love too but it is a new balancing act. Jon is doing his best to keep the big girls occupied while being there for me. He slept on the couch last night to get a more solid sleep so he can be more energetic for Livi and Sofie during the day. My mom has also been an awesome help with Sofie especially! Jon is back to work for 2.5 weeks starting on Thursday. My mom is around and Jon’s mom will come stay for a couple weeks to help out as well. Then Jon has a few months of parental leave! This will be so nice 🙂 I’m feeling very blessed and loving having a pink, estrogen filled household! Feel free to come for a visit soon. Maybe text me first to make sure we are totally up for it but I think we are doing pretty good! Epic birth story is right!! Thanks for sharing. Excited to meet her! Congrats! I am so glad that all went so well… even if not as planned. She is beautiful just like your two big girls! Welcome to the world of three girls!! It's a wild, wonderful, tiring ride! Oh Katie, you had me laughing a couple of times there. What a story! Such drama this little one, definitely one of the fam 😉 Congratulations and great job- sounds like you made the maternity team a real run for their money on Sunday!